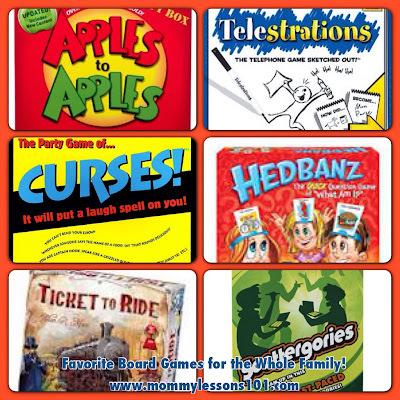 Mommy Lessons 101: Top 30+ Favorite Board Games for New Year's Day Fun! Top 30+ Favorite Board Games for New Year's Day Fun! Every year, my parents have an open house on New Year's Day. There is tons of food: salads, mini ham sandwiches, 7 layer dip and chips, vegetable trays, jellos, etc. Friends and family from over the years spend the day playing games and watching football. Card tables are set up all around the house and stacks of board games and card games are available. It's a really fun chance to get to try out some new games as well. We LOVE board games in our house. It stems from a long heritage of game players. I fondly remember playing "Hit the Table", Dominos, Rook and other games with my grandparents. One of my spunky grandmas did not like to lose to Rook, and I still giggle thinking about it. This year I lost my last grandparent and the memories I have of playing games together will always be there. The tradition has passed down through the generations. We often play games to get our jobs done around the house. After a round of a game, who ever lost gets to choose of of 2 jobs first. The loser gets the leftover job. I feel that games bond families together. I also feel that we learn a lot from playing games. Children learn math skills by keeping score. They learn to have good sportsmanship. They learn about concepts in life like geography, money managing, and organization. They also keep their minds quick and memories working. So here's a roundup of some of our favorite board games, tried and tested! Telestrations the Telephone Game Sketched Out! I have played each and every one of these games and love them all. Hope you enjoy them and if you have a game I NEED to play or add to the list, please comment below. I'd love to hear!